This Saturday I finished hike number 24/52 for the 52 Hike Challenge in 2015, and have now completed 274 of my goal of 1000 miles for this year. The month of April was not a good one in regards to achieving my 1000 mile hiking goal for the year. Towards the end of March, a bit of tendinitis started to flare up in my knee. Instead of pushing through it, I made the call to take three weeks of for rehab and rest. I probably should I have jumped into things a bit slower to start off the month of May, but I’ve been wanting to hike Iron Mountain for a long time now, and decided on giving it a go. To reach the 8007 ft summit of Iron Mountain via Heaton Flats, Julia and I started from the Heaton Flats trail-head north of Azuza (2200 ft). The parking lot was completely full and bustling with day hikers heading out on the much more popular “Bridge to Nowhere” hike. Iron Mountain is definitely a great hike if you like solitude, after starting towards Iron Mountain, we only saw one other group hiking. From the parking lot, we made our way down an access road to the Heaton Flats Trailhead. If you head right, you’ll be on your way to Iron Mountain, if you stay on the road (left), you’ll be on your way to the Bridge to Nowhere. The trail starts out with a smooth singletrack that begins gaining instantly. The difference between the trailhead elevation and the Iron Mountain summit elevation is about 5800 ft (2200 to 8000)… but because of the roller coaster nature of the trail, the total elevation gain is 7200 ft! This is a trail that is not used very frequently, as the surrounding shrubs and brush constantly reminded me. I can’t even begin to count the number of times my skin jousted with a yucca plant and lost. The positive side to this solitude is getting to see the flora in fauna without disruption. One of the major highlights was seeing a horned lizard just after entering the Sheep Mountain Wilderness Area. After about 4.5 miles of hiking the trail really started to increase in steepness. There were certain sections that felt like climbing straight up a wall. To make things tougher, you have to dodge the aforementioned yucca spears and keep your footing in some shifty gravel ruts. It made for a great challenge on my creaky knee, but our progress was still good. The weather forecast called for 90 degree temps, and we could really feel it. Luckily, the breeze seemed to get cooler with every step we took. The next two miles were a blur, as it was just about putting one foot in front of the other to climb higher and higher towards the summit. The sight of Iron Mountain’s summit alongside Mt. Baldy under a canopy of cumulus clouds gave us the perfect reason to stop and take it all in. The final half mile to the summit of Iron Mountain is a rather enjoyable one. After climbing almost 2000 ft of elevation in the final mile of hiking, the smell of victory grows closer than ever. We made it to the summit after about 4:30 on the trail, and were blown away by the spectacular views. I’ve looked down on Iron Mountain from Mt. Baldy so many times, and felt privileged to be standing on what many consider to be the most difficult hike and most inaccessible peak in the San Gabriels. Julia and I took some time to rest our legs while taking pictures and becoming one with the landscape. 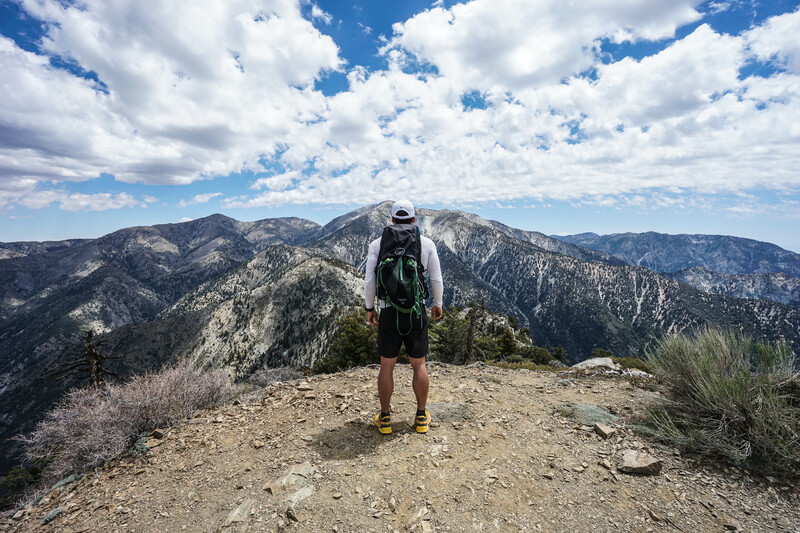 There is no bad view from the summit of Iron Mountain, with a breathtaking 360 degree vantage point in the heart of the San Gabriels. The descent towards the parking lot was even more difficult in some ways than the climb. Walking downhill is tough on the legs in the best of conditions, but with this grade and my bum knee, we had to move very carefully. It was also starting to move into the hottest part of the day, and we could feel the temperature increasing with every foot of elevation we gave up. We made it back to the car after a round-trip journey of about 8 hours. This was a great hike, and although it was my first summit of Iron Mountain, it definitely won’t be my last. I was wondering what happened to you! Glad to hear that you are on the mend even though a tough hike this one might not be exactly what the doctor ordered. Here’s to a quick recovery! Thank you! So far so good on the recovery. I’m going to keep my fingers crossed and keep up with the rehab/prehab work! Nice hike! I love the nature over there, it’s quite different from what I’m used to see. Took me a while to spot the horned lizard! I may do this over the Memorial Day weekend as a training hike for Whitney. Looks fun/exhausting. It would be a great training hike for Whitney! Have fun!